Learn about some of our thinking behind, and the mechanics of, saving electricity and gas @Home. As of 2008/02/27 a grid-tie 1.29kWp solar PV system came on-line. This system should, on average throughout the year, generate ~2kWh/day (>4kWh/day in summer, but <0.4kWh/day mid-winter). It should reduce imports by ~1kWh/day. It should thus remove the effect of the office consumption. As of 2008/03, the system seems to be in balance with our baseload, with no big/discretionary appliances nor the fridge/freezer running. The import meter is stationary at around 40W of PV generation, ie ~1kWh/day. As of 2009/02/10 the grid-tie PV system on our roof has been expanded to nearly 4kWp. That should generate nearly 3MWh/y compared to a consumption in 2008 of ~2MWh/y. I use energy at my clients' offices, and in the various hosted servers that I use worldwide. As of November 2007 I'm trying to trim the power consumption of my offsite servers a little. For example minimising consumption of my London (UK) server at the time of UK electricity peak load (mainly 4pm--10pm local time) and above-mean carbon intensity. That in turn reduces strain on the grid (a tiny amount!) and saves the CO2 from more carbon-intensive sources such as coal in 'peaking' and other generators at this time. For my Mumbai/Bombay (IN) Web server I'm deferring non-essential work 0700--2300 local time, in the spirit of the 2005/05/04 demand-curbing order of the Maharashtra Electricity Regulatory Commission. For the Sydney (AU) server I'm treating 0700--2300 (local) as 'peak' time, based on load graphs for nearby Victoria. 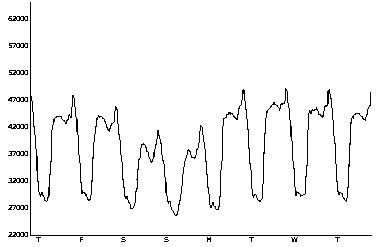 For the Atlanta (Georgia, US) server, apparently summer (Apr--Sep) 2pm--10pm EDT is the peak load window. So I reduce my consumption then. I hope to handle the same global traffic with less CO2/day in future. But with similar low-latency response by keeping well-distributed mirrors. Also, we avoid using the dishwasher and washing machine at home during winter peak-demand hours (4--9pm) so as to reduce overall CO2 generation. As of January 2008 South Africa has been experiencing rolling blackouts (load-shedding) given various constraints on generation and transmission. It will likely be several years before this can be fixed. [Might you suggest] implementing a similar rule to that currently being touted in South Africa to help economise on electricity usage and deal with their acute shortages and load-shedding black-outs? It is nice and simple, doesn't penalise the (energy) poor, and has analogues from deliveries of other constrained resources such as water. Simply that any user of electricity that exceeds 500kWh/month gets time-of-day metering, which is not necessarily more expensive, but rewards those users for avoiding times of peak demand. In effect it is a far more dynamic alternative to schemes such as 'Economy 7'. It will also tend to encourage more economy in winter when electricity generation is likely to be more carbon intensive. We have the technology for time-of-day metering already. A couple of the MEPs have responded that they will forward my suggestion to the relevant European Commissioner. Your ideas are certainly very interesting and I will certainly put them to energy experts in the European Parliament and in London. However, we should also note that the acute shortages and black-outs being experienced in South Africa are partly due to Eskom pricing energy so cheaply (for political reasons) that there was no incentive to encourage energy efficiency and conservation. Eskom's low tariffs have also driven away much needed potential local and foreign private investors. Let's hope that Eskom and the South African government have learned the lessons and move towards more energy efficiency. I agreed that while the causes/motivations aren't identical, the solutions might be much more nearly so. The reduction of electricity consumption through the use of TOD metering ... is indeed one of a series of differentiated methods applicable to energy saving. The implementation of innovative measures aimed at reducing the energy demand of the houses (and hence CO2/GHG produced from electricity generation) without penalizing comfort is one of the essential elements in energy management policy. The projects on Eco-building and Concerto are examples in this field and more information can be found in their respective websites: [http://ec.europa.eu/energy/] and https://concertoplus.eu. See the early 2008 proposed regulations and the Homeflex study from South Africa. An excess unit of solar-PV-generated electricity exported in summer daytime probably displaces efficient CCGT (gas) burn which is the least carbon-intensive fossil-fuel generation mechanism/fuel. But a unit imported when the sun is down, especially at winter peak demand, will have used in part a more carbon-intensive generation method and fuel, so zeroing the electricity use has not zeroed the carbon generation. This is especially likely given the "Large Combustion Plants Directive" (LCPD, 2001/80/EC, PDF on the Europa website) in force from 2008/01/01, limiting the total number of running hours of 'opted-out' fossil-fuel generators to 20,000 across the 8 year period to 2015. It is not clear how each plant will be run, but probably some will generate only at times of peak prices/demand to maximise profit. If we were completely off-grid then we'd have to cover each day's use by our own RE generation, probably mainly from solar PV in urban London. For our 7kWh/day to be covered in mid-winter we'd need 7kWp of solar PV (plus a least a day's storage in batteries, or several days' for bad weather) compared to the 4kWp we'd need for year-round net-zero electricity. In fact, storage in batteries probably loses ~20%, so we'd better allow 8kWp, ie double our net-zero-electricity value nameplate peak capacity. And adding the storage to cover several days' bad weather redoubles costs, bringing us to maybe £100k to lose/zero all grid dependence and thus to erase the carbon footprint for our electricity. However, we can then do better than zero-electricity and zero-carbon, by reconnecting to the to the grid in summer to export any excess, maybe 80%. We become a little solar PV generating station for the grid all bar mid-winter. 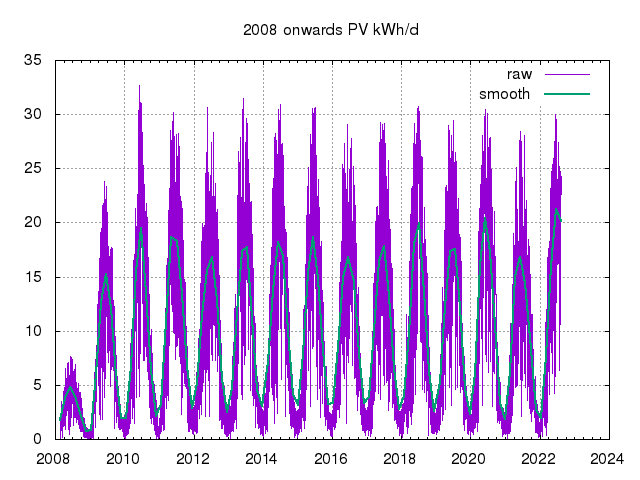 We might not even be allowed to export ~30kWh/day on our existing single-phase connection, especially given that there is a current limit of ~16A peak. However, if (for example) we optimised panel orientation for mid-winter output and/or to spread generation throughout a summer day (eg with panels facing east and west rather than all south) possibly with some simple mechanical adjustments by season, then our exports would reduce CO2 generation for other grid users, and thus be 'negative carbon' from our point of view. Our 8kWp system might produce ~4MWh/year excess to our needs, ie exportable, (of maybe 6--7MWh/year available generated power total), which we might sell in London to the local distribution network (EdF) for ~£500/year including ROCs, etc. So we wouldn't get rich that way (200 year payback cf 25 year equipment life), but we would be 'negative carbon' for electricity. This doesn't cover our space/water heating (CH/DHW) requirements. As of late November 2007 I sent an enquiry to the National Grid to see if a G83/1 (11kW/3-phase) inverter would be useful to them as part of their standing/frequency reserve used to help maintain grid stability, for example when a generator drops out unexpectedly or load spikes unexpectedly. With a relatively small (6kWh) battery bank such a grid-tie inverter system might be able to cut in very fast (within one cycle) and run for 30 minutes in case of falling frequency or other stresses such as mid-winter peak demand, even when the sun is down, which seems to meet some of their technical requirements (eg plant must be able to start delivery within 2 minutes of instruction, have a run up or run down rate of 25MW per minute, and must have capability to sustain output for at least 15 minutes) but fails to meet another by more than three orders of magnitude (that the plant can be instructed in blocks of at least 50MW). I'm all in favour of explicitly contributing to grid stability as part of a distributed generation system, and providing reserve might earn some fees. As of 2009/02/10 the grid-tie PV system on our roof has been expanded to over 3kWp and our consumption reduced sufficiently that we will be net exporters over the course of a year, possibly with sufficient margin of excess export that we can expect to be carbon-neutral (or negative) for electricity. 2011 was in fact probably slightly carbon-negative and we continue to work on efficiency. To deploy a really large solar thermal/PV system effectively in all regards, including financially, it makes sense to have the capital and other expenditure handled by an independent financial entity with, for example, VAT registration to avoid 'losing' 17.5% down the cracks on expenditure, etc. This company would be an ESCo (Energy Services Company). There would have to be a little care taken (and maybe some negotiation with the tax authorities) to ensure that, for example, having a large chunk of the roof area covered with collectors does not somehow undermine full capital gains tax relief on the property. In particular, that is likely to mean the household paying the ESCo at least a transparent commercial rate for energy provided. Presumably on moving out the ESCo would have to be sold at fair commercial value to the new home owners. But would that count towards stamp-duty thresholds for example? As of early 2008 my consultancy company is going carbon neutral for the office at home with a modest ~1kWp scheme. It will act as its own ESCo. First published 2017-08-15 , updated 2019-04-22 . Site copyright © 2007-2019 Damon Hart-Davis. Hosted by ExNet.